If you are reading this then I am going to assume you have gleaned the unavoidable fact that lure fishing rods fascinate me, and whilst I am lucky to get my hands on so many of them for playing with and often reviewing on here,, sometimes a particular lure fishing rod turns up here that I would classify as a game changer………. 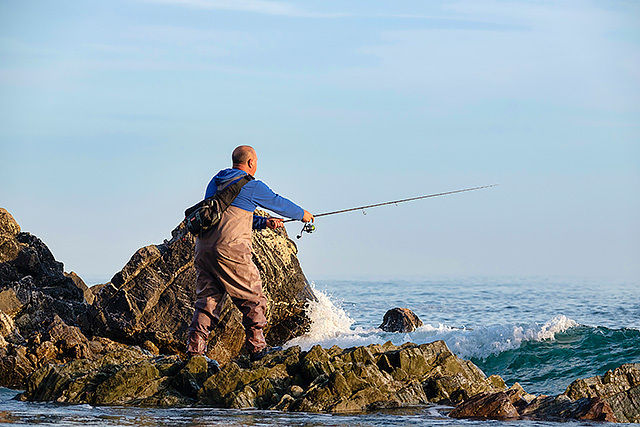 So what’s a game changing lure rod? Well to me it’s either that the thing is so damn good I can’t contemplate not continuing to fish with it, or a particular rod offers what I feel is a very special level of value for money. The sub-£200 UK price Major Craft Skyroad 9’ 10-30g lure rod was and indeed still is a game changing lure rod to me. An incredible amount of serious lure fishing rod for sensible money - and nope, just under £200 is not cheap, but compared to what else has come through my hands here around the same specs and prices, the 9’ Skyroad and more recently the Tailwalk Saltyshape Dash Seabass 90ML 9’ 7-28g sit there as the best value for money all round 9’ lure rods I have come across. Same with the Major Craft Skyroad Surf 9’6’’5-28g as my game changing, sub-£200 9’6’’ rod, then the more expensive HTO Shore Game 9’6’’ 7-35g at its more high end price point, and so on. So this £119.99 HTO Nebula M 2.7m (9’) 7-35g lure rod turns up last week - and although it’s quoted as 2.7m on the TronixPro website, I’m going to call it a 9’ rod because I prefer imperial measurements over metric for fishing rods. It’s only my opinion of course, and as ever fishing rods are very personal things, but this HTO Nebula M 9’ 7-35g lure rod is just fantastic. I tend to give a lure rod more time than this before doing a review on here, but this new 9’ Nebula does it for me in such a big way that I couldn’t hold back. But if you don’t like very fast lure rods then this HTO Nebula M 9’ 7-35g is not for you, indeed it’s described as “Ex Fast” by TronixPro, the people who are responsible for this increasingly impressive HTO range of lure fishing tackle. I do err towards fast rods as to me they make a lot of sense, and I knew from the very first waggle that this thing was going to float my boat. I like the length, I like the casting rating, I like the Fuji VVS reel seat (why oh why do companies bring lure rods out without something “grippy” for where your rod hand sits behind the reel? Well done HTO here), I like the Fuji Alconite guides and how they are nice and small towards the tip, I like how light and precise the rod feels, I like how it feels when you are casting well, I like how it sits in my hand when I am fishing (ok, in a perfect world I’d prefer an inch shorter handle, but then that might just be me), so overall that’s a lot of likes! 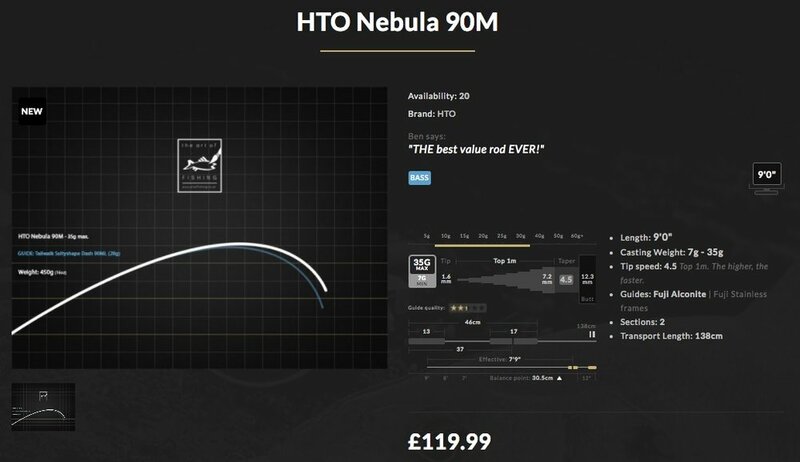 To me that adds up to loving this new HTO Nebula 9’ rod. 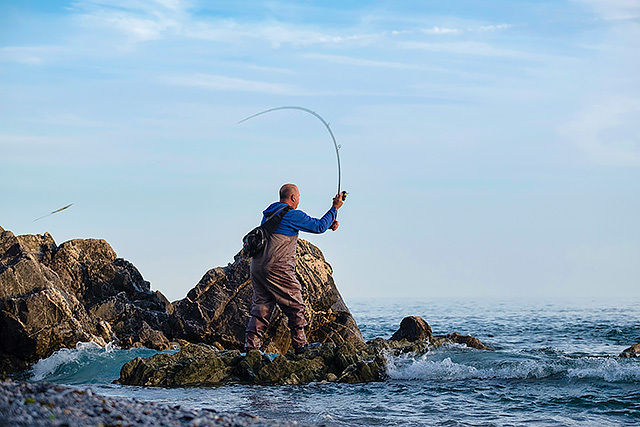 Whether you do is going to depend on what sort of lure rod floats your boat, but I have a hunch that the greater percentage of anglers err towards a faster action - and this rod’s got that in spades. I know that this HTO Nebula is not a high end price, but I can’t feel anything remotely “budget” about it when I am fishing with it. Sure, you are getting a degree more subtlety or finesse if you like with those two more expensive 9’ rods, the Skyroad and the Tailwalk I mentioned previously, but on the other hand I reckon this Nebula’s extra fast action will float a lot of boats. I am interested to see that there’s a 7’ long 5-22g Nebula in the range, and I would be fascinated to see what a 9’ version with the same casting rating would be like. I’d also love to see a 9’6’’ version rated the same 7-35g as this 9’ rod I am reviewing here, because I reckon that could be an equally special rod as well. I have tried to trip this rod up, but for me it just works. It’s good with lures like my beloved OSP DoLive Sticks (ok, as per above, ideally give me a touch more “finesse”), you can absolutely leather the Patchinko and the rod’s got plenty more to give, a 30g+ casting jig is getting close to emptying my reel, surface lures at range especially are a doddle, and working something like the Fiiish Black Minnow around feels great. I reckon this 9’ Nebula would make a fantastic wrassing rod as well if you’re happy to go to 9’ for this kind of fishing, indeed with the power and precision on offer here I can’t see why not. So there you go - this HTO Nebula M 9’ 7-35g is one of those lure rods that occasionally comes along which to me redefines what is possible at the price point. Sure, you can get fancier guides and reel seats - even though the components on this Nebula are great - but to get such a “proper” all round lure rod with such a steely kind of action at this price? To me this HTO Nebula M 9’ 7-35g lure rod is a game changer, and if a better rod for the money comes along this year I’ll be gobsmacked. Well done yet again to the UK based TronixPro and their HTO lure fishing brand.